Easy Does It is excited to announce the addition Disaster Preparedness to our core services! We have developed an individualized home-based emergency preparedness curriculum, tailored for people with disabilities and seniors. The 90 minute one-on-one training will be provided in the households of 40 area residents. We will discuss strategies and ideas to better prepare ourselves, with a focus on disability-specific needs. This training is intended for people living with paralysis, members of their household, and caregivers. We will also provide a free Go-Kit, with handy items for an emergency, to start you on your preparation journey. These recent events motivated Easy Does It to expand its core services to include Disaster Preparedness. The Christopher and Dana Reeve foundation awarded Easy Does It Emergency Services a Quality of Life grant so that people living with paralysis may be better prepared for an emergency situation, such as fires, earthquakes, and other natural disasters. “This program is important to our community, because we want our community to be safe, and we know that the best way to avoid future loss of life is to do something now,” Nikki Booker, Executive Director of Easy Does It. In 2015, Easy Does It surveyed the disability community on their preparedness levels and interests. The survey found that respondents were motivated and interested in increasing their preparedness, and that many didn’t have the resources to prepare for themselves. 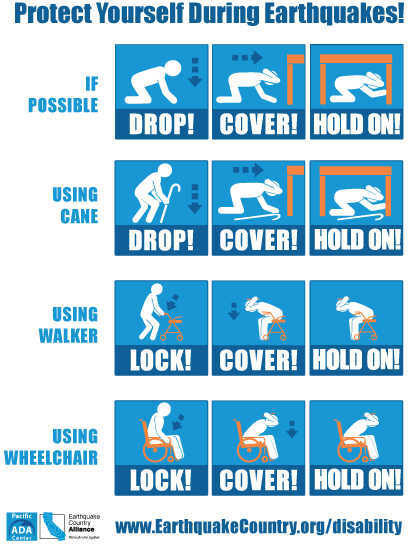 Many have multiple disabilities, which limit their participation in generalized emergency preparedness trainings. Respondents asked for oneon- one trainings in their home to get started on a process of developing preparedness strategies to address their individual needs. As a response to this need in the community, Easy Does It developed an individualized home-based emergency preparedness curriculum. The one-on-one training, tailored for people with disabilities and seniors, will be provided in the households of 40 area residents. For more information about this program, please visit our website at www.easydoesitservices.org. The award to Easy Does It Emergency Services was one of 66 grants totalling $1,230,983 awarded by the Reeve Foundation to fund a variety of projects and programs to benefit the paralysis community, strengthening the Reeve Foundation’s dual mission of Today’s Care, Tomorrow’s Cure®. Funding for this new cycle of grants was made possible through a cooperative agreement with the Administration for Community Living (ACL). “Through our federal partnership with ACL, we constantly strive to make the Quality of Life Grants Program the very best it can be,” said Donna Valente, Senior Grants Manager. “We are gratified that the new grants structure will help to support ACL’s strategic priorities and honor Dana’s vision and her legacy of caring by maximizing the impact of the grants.” This cycle piloted a tiered grant approach, with three higher-dollar amount levels of High Impact Priority grants that support key areas of need for the community of people living with paralysis, as well as a Direct Effect tier that is broad in scope and awards grants up to $15,000. The High Impact Priority areas include Employment (5 grants at $50,000 each); Nursing Home Transition (4 grants at $40,000 each); and Transportation, Respite/Caregiving, and Disaster Response, each with 3 grants of up to $30,000 each. The Foundation received an unprecedented total of over 600 requests, and after a rigorous review process, ultimately funded 18 High Impact Priority grants totaling $679,922 and 48 Direct Effect grants totalling $551,061. The Reeve Foundation is dedicated to curing spinal cord injury by funding innovative research, and improving the quality of life for people living with paralysis through grants, information and advocacy. Visit https://www.christopherreeve.org/ for more information. Easy Does It Emergency Services provides assistance to individuals with disabilities and seniors living independently in the City of Berkeley. Should a disabled person or senior experience an unforeseen crisis or a temporary lapse in attendant care, that person can call Easy Does It for assistance. For more information, visit www.easydoesitservices.org , or call 510-845-5513.